Found in the vast lowland forests of central Africa, the western lowland gorilla is by far the most widespread and numerous of all gorillas. Western lowland gorillas are smaller and lighter than the other gorilla subspecies, with short hair, a wider skull and a more pronounced brow ridge. The ears also appear small in relation to the head. There is also a more pronounced difference between the sexes, with females being almost half the size of silverbacks. Colour: Brownish-grey coat with a red or auburn crest. Adult males have a patch of whitish hair that extends onto the thighs, grading into the black body color. The western lowland gorilla occurs in the rainforests of central Africa, specifically in lowland forest and swamp forest from sea level to about 1,600m. The western lowland gorilla has the smallest family groups of all gorillas, averaging 4-8 members. Gorillas are mainly herbivorous; their staple foods are pith, shoots and leaves. Fruits are also an important component of western lowland gorillas’ diet and are consumed according to their seasonal availability. Over 100 fruit species have been recorded in their diet. In drier months, when fruits are scarce, gorillas supplement their diet with leaves, pith, shoots and bark. They have also been know to eat termites and weaver ants. Western Lowland Gorilla (Gorilla gorilla gorilla), silverback male. Stem-peeling is a favourite feeding technique. 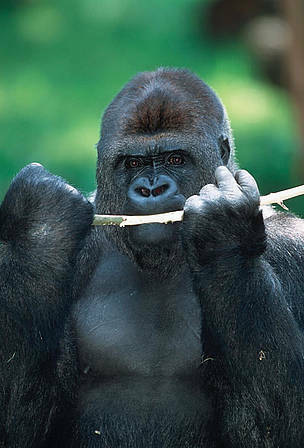 The western lowland gorilla is the most widespread and numerous of the four gorilla subspecies. No accurate estimates of their numbers are possible, as these elusive apes inhabit some of Africa’s densest and most remote rainforests. However, the total population is thought to number up to 100,000 individuals. In some areas they occur in surprisingly high densities – like in remote swamps or areas with dense leafy growth where they’ve been recorded at exceptionally high densities of almost 10 individuals per square kilometer. The forests of Congo (Brazzaville) are currently considered to harbour the major population of western lowland gorillas, which are protected by the remoteness of the large, swampy forest areas. Hunting is the main threat to western lowland gorillas. Gorillas are sought after as food (bushmeat) and pets, and their body parts are used in medicine and as magical charms. The impact of hunting on gorilla population has proven to be dramatic. In North East Congo, it has been estimated that approximately 5% of gorillas are killed by hunters each year. Despite national and international laws prohibit the hunting and capture of gorillas throughout their range, rampant corruption in the wildlife legal system weakens the enforcement of existing legislation. Timber is a major export in Central Africa. Vast areas of rainforest in the western lowland gorilla's habitat in the Congo Basin have been destroyed or leased out to European and Asian logging companies. The increase in timber extraction and the opening of once remote forest areas, together with the easy transport provided by logging vehicles to distant markets, have also facilitated the bushmeat trade. The expansion of agriculture also poses a threat, particularly the growth in oil palm plantations. Central Africa, the home of western lowland gorillas, has been dramatically affected by Ebola hemorrhagic fever. Some scientists estimate that Ebola has killed about one-third of the wild gorilla population here, mainly western lowland gorillas. Evidence suggests that the virus may still be moving through the Congo Basin, placing a large gorilla population at risk. 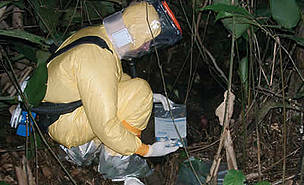 Ebola is a significant threat to gorilla populations in Central Africa. 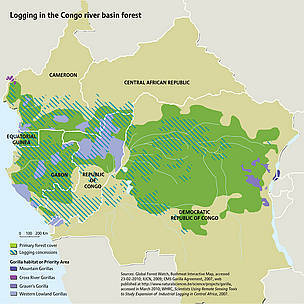 Logging in the Congo river basin forest. China is the largest consumer of logs from the DRC, buying near 38% of the roundwood produced in official statistics in 2008 (Ministère des Eaux, Forêts, Chasses et Pêches du DRC, 2009). 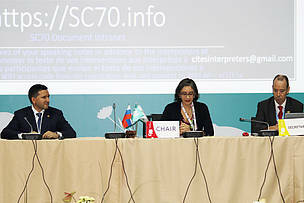 However, the official numbers only reflect approximately half of what is being cut, the remaining illegally, often transported across borders to neighboring countries. Specific work for western lowland gorillas focuses on the Sangha Tri-National collaboration, a trans-border initiative covering 36,000km² of protected areas: the Dzanga Sangha Protected Area complex in the Central African Republic, neighboring Nouabale-Ndoki National Park in the Republic of Congo, and Lobeke National Park in Cameroon. Supported by the World Bank/WWF alliance, WCS, GTZ, CARPE (USAID) and the French Cooperation, the initiative aims to enhance the conservation efforts among the three countries. Gorillas and other great apes are a priority species. WWF treats priority species as one of the most ecologically, economically and/or culturally important species on our planet. As such, we are working to ensure gorillas can live and thrive in their natural habitats. Female western lowland gorillas do not start reproducing until they are around 9 years old. They generally have one offspring every 5 years. Meet the gorillas of Dzanga-Sangha!